©2007-2008 Chinatsu Ban/Kaikai Kiki Co., Ltd. All Rights Reserved. 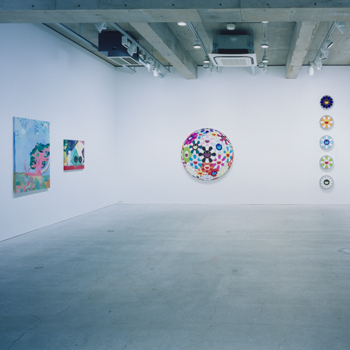 ©2007-2008 Takashi Murakami/Kaikai Kiki Co., Ltd. All Rights Reserved. Announcing the opening of the Kaikai Kiki Gallery. It has been one year since the space which the gallery will occupy was acquired – a year in which we have opened our doors by appointment only to select guests. During that time, we have gradually built up a base of professional knowledge and it is with great pride that we will mark our official debut as a gallery this Spring. To commemorate this special occasion, we will be holding a group exhibition featuring our lineup of Kaikai Kiki Artists. This is your chance to see several works by these leading international creators all in one place. On the heels of the inaugural exhibition, we also have a solo show scheduled for Rei Sato in April and Seonna Hong in May. Several other exhibitions by artists from outside of Japan are also in the works. We hope you look forward to what the future brings.